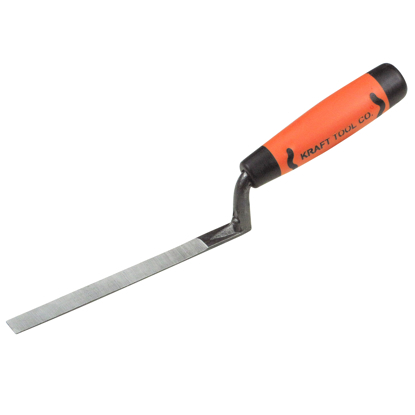 The narrow 7/8" wide blade is ideal for tuckpointing, caulking, and other tight jobs. The 6-5/8" blade and tang are forged as one-piece for strength and flexibility. The trowel is then tempered for strength, ground for flexibility and polished to better hold mortar. The tool is designed for perfect balance during use to reduce fatigue. A favorite trowel for masonry restoration and repair. The 4-1/2" ProForm® soft grip handle provides a comfortable and confident grip even when wet. The orange handle is easy to spot on a job site. The trowel's overall length is 11". Proudly made in the USA.